Bioassessment has shown significant promise as an effective tool for ambient water quality management in many regions of California. However, the scale and intensity of landscape and water transport alteration in the Central Valley pose substantial challenges to implementing bioassessment to its full potential in the region. Bioassessment programs usually are established around a careful characterization of regional reference conditions, which can be defined as the condition of waterbodies that are least impaired by human activities. The reference condition defines a benchmark against which to infer biological impairment and to set expectations for biotic condition. Although there are several techniques available for determining reference condition, by far the most commonly applied is the use of reference sites, which are used to establish the range of natural variability in biotic condition. We investigated the potential for identifying reference sites for segments of sloughs and creeks of the Sacramento Valley at elevations less than 85 meters. We describe here the results of a pilot study designed to adapt an existing reference site selection methodology for use in the Central Valley. Potential reference sloughs and creeks were selected on the basis of a suite of visual assessments of riparian and instream condition and qualitative GIS-based land use data. Analysis of the benthic macroinvertebrate (BMI) assemblages collected from 30 targeted reference sites (23 creeks and 7 sloughs) was focused on addressing two main questions: 1) should creeks and sloughs be considered unique waterbody classes for the purposes of bioassessment?, 2) what is the potential for reference site based bioassessment in valley waterbodies? We addressed these questions with the BMI data using a combination of direct metric comparisons and NMS ordination. To improve our ability to interpret patterns at our 30 sites, we included two additional datasets of BMI data recently collected from nearby waterbodies. We drew three general conclusions from this study: 1) the adaptation of reference site selection to Central Valley streams was effective; we were able to find sites in the valley to use as reference and there is enough diversity in the BMI assemblages at these reference sites to use them to detect impairment, 2) although creeks and sloughs may need to be treated as separate classes of waterbodies for bioassessment-based regulation, there is evidence to suggest that the differences are not clear-cut and the question needs further investigation, 3) BMI assemblages in valley floor reference sites are clearly different from those in foothill reference sites. We discuss the potential for reference site based determination of reference conditions and summarize the current state of the science for defining reference condition in regions without adequate reference sites. 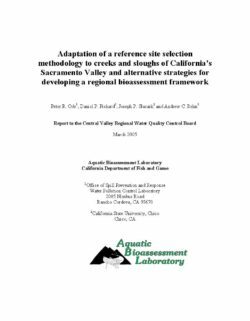 We also list a set of recommendations that the Central Valley Regional Water Quality Control Board should consider while constructing a defensible framework for bioassessment in the Central Valley.